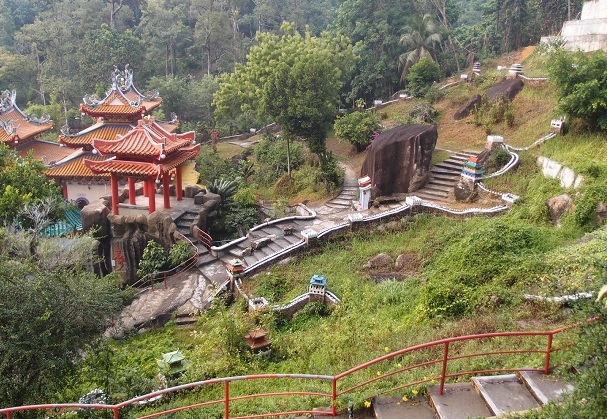 The Fu Lin Kong temple is located on the east coast of Pulau Pangkor. It is the largest Taoist temple on the island. There are a number of Chinese inhabitants on Pangkor who adhere to the Taoist doctrine. The temple is the center of worship of Taoism on the island, the religion that follows the teachings of Lao Tze, a great Chinese philosopher. The Fu Lin Kong is also one of the most popular tourist attractions on the island. This Taoist temple was built at the foot of the Pangkor hill in the village of Sungai Pinang Besar, a Chinese settlement (Kampung Cina). It also attracts people who are looking for a picture with a picturesque landscape with a typical Pangkor background. 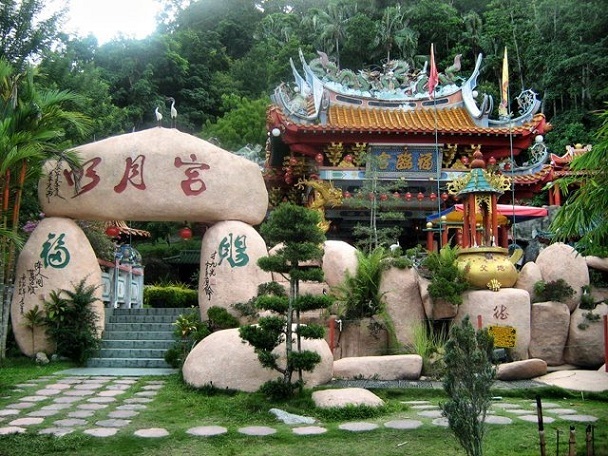 The Foo Lin Kong temple is more than a hundred years old and decorated with large rocks and stones. In addition to the beautiful arch to welcome visitors and a majestic temple wall, there is a mini Great Wall of China in the garden at the back of the large temple hall. Inside the temple are also Buddhist statues. The beautiful garden around the temple is partly built against the hill. The population also comes here to exercise through the hill and walk along the mini Great Wall of China. On the roof of the temple you see the 12 signs of the Chinese zodiac. There are twelve signs of the Chinese zodiac carved on the roof and there are many fish and turtles in the surrounding ponds, which further enhance the fascination of the temple. 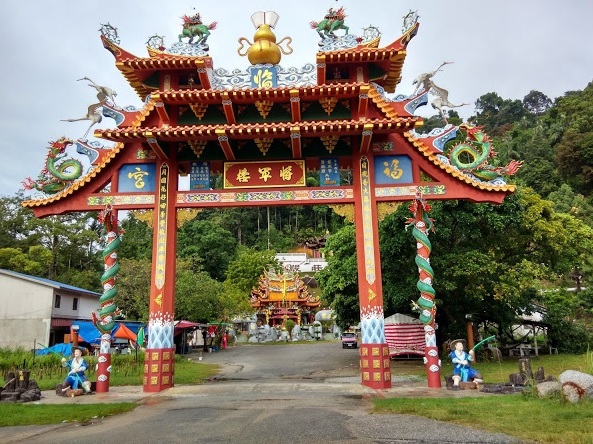 Visitors who do not mind walking can also climb the hill behind the main part of the temple to admire the picturesque view of the multicolored Kampung rooftops, the vast ocean, the fishing boats and the ever so blue sky of Pangkor. Apart from the lavishly designed exterior, there is also a very unique exhibition in the temple - a medium-sized drum that allows her to grow! The rumor spread like a running fire. Residents of Pangkor wanted to see this hair-growing drum themselves. An unusual phenomenon, which was claimed to be a sign of the Gods. People collected pieces of hair to keep in their wallets because they believe it would bring them happiness. There is an interesting story about the Fu Ling Kong temple. Iron-Crutch Li (one of the eight immortals of gods from the Taoist kingdom of gods), who was also the head of the gods of the temple, invited Lord Guan to oversee the temple. The righteous Lord Guan accepted the offer. When he completed his task in the temple, Li Guan begged to honor him with another job. What Lord Guan did not know was that this would cost him another 12 years!There is an interesting story about the Fu Ling Kong temple. Iron-Crutch Li (one of the eight immortals of gods from the Taoist kingdom of gods), who was also the head of the gods of the temple, invited Lord Guan to oversee the temple. The righteous Lord Guan accepted the offer. When he completed his task in the temple, Li Guan begged to honor him with another job. What Lord Guan did not know was that this would cost him another 12 years! Beware: the boss of the temple keeps some monkeys in small rusty and dirty cages. 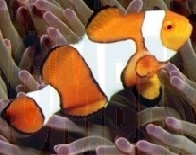 The poor animals look very sick and exhibit behavioral disorders. Pure animal abuse.Beware: the boss of the temple keeps some monkeys in small rusty and dirty cages. The poor animals look very sick and exhibit behavioral disorders. Pure animal abuse.